This special promotional price is only available online and no where else in the world. Now you can have my smooth legs delivered to your doorstep. Click here to order. My Smooth Legs™ not only work for women, it has solved many men hairy chest problems as well. Now you can enjoy the fashion for the smooth mahogany hairless chests like David Beckham and Daniel Craig as James Bond. We use My Smooth Legs™ Micro-Crystal Pads to buff away unwanted hair and exfoliate at the same time. Each My Smooth Legs™ Micro-Crystal Pad contains thousands of micro crystal particles that gently but effectively exfoliate the skin while removing hair at the same time. Fast and easy, with NO smelly & harmful chemicals, NO cuts, NO fuss and NO razor bumps! My Smooth Legs™ leaves your skin smooth and comfortable. Use My Smooth Legs™ only in circular motions, with slight pressure. Do not press down. Going first in one circular direction then the other. Repeat until all the hairs have been removed. In just a couple of minutes, my skin is left hairless and smooth with no razor bumps or red patches. I've tried almost all methods of hair removal but nothing compares to My Smooth Legs™. I believe My Smooth Legs™ is the answer to my prayers! Hair removing had always been a nightmare for me as my hair grows back relatively fast. Now with My Smooth Legs™, hair removal is a breeze! I use it every couple of days and my skin is left silky smooth! NO NICKS AND CUTS ANYMORE! 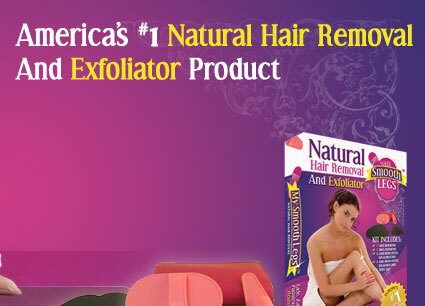 I use My Smooth Legs™ every 5 to 6 days to exfoliate and remove unwanted hair. I simply rub gently in a circular motion a couple of time and the hair is GONE!!! It just leaves my skin incredibly smooth with no nicks and cuts!!! I am totally amazed with this new revolutionary product! All I did was to rub the pad onto my legs with little pressure for a while and everything is gone! Most importantly, it leaves my skin smooth without any uneven surfaces. © Copyright 2019 My Smooth Legs, Thousand Oaks, CA91320. All Rights Reserved.